Lois is our Children's Book Specialist. 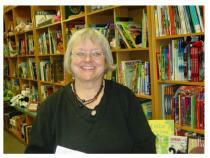 She works with schools and libraries, and she can help you find that perfect book for your child or grandchild. Kate Quinn, author of The Alice Network, has written another spectacular historical novel that focuses on World War II. Of great interest to me were the Russian women fighter pilots, known as the Night Witches! When one of the pilots, Nina, ends up in German territory, she has to elude the Nazi murderess known as The Huntress. British war correspondent, Ian, becomes a Nazi hunter after the war, and joins up with Nina on the path of The Huntress. A fascinating story that involves an unknown musical masterpiece, the plot follows this music through the centuries. Meta Taverner is given part of a sonata that appears to have been written in the 18th Century. Tasked with finding the owners of the rest of it and putting the parts together, she heads to Prague to uncover the truth about this amazing piece of music! This is an honest to goodness ghost story for elementary aged children that adults will enjoy as well. When three siblings go to Britain to spend a few weeks with their aunt. strange things occur in and around her historic thatched roof cottage. The past comes to haunt the children and they scramble to figure out what is going on! It is 1845 and New York City has just founded it's police force; the giant potato famine has hit Ireland, forcing millions to emigrate to America where anti-Irish rage is at an all time high and crime is rampant. A devastating fire has forced Timothy Wilde to reluctantly become an NYC "copper". Trying to stay clear of gang and Tommy Hall politics, he attempts to find a brutal killer who is striking fear in the hearts of New Yorkers. A riveting and beautiful mystery, I highly recommend. This excellent memoir follows the friendship of two very different women. Marjorie Price was in her late twenties when she went to france. There she mees and falls in love with a young French painter. They move to a remote farm in Brittany where she meets Jeanne, an elderly French peasent woman, whose frindship will sustain Marjorie when her "perfect" life unravels. A remarkable read. This is a fascinating story of two women who become unlikely companions in 1922. Louise Brooks, who really lived and was a silent film icon, is only 15 when she leaves Wichita, Kansas for New York City with her chaperone, 36 year old matron Cora Carlisle, who is truly the heart of this book. The many layers of her story will captivate you. This is a well developed portrayal of the social upheaval the Jazz Age brought to every corner of American life. I found it a very satisfying read. Delilah Drummond becomes mired in a scandal after the suicide of her thrird husband. From a wild lifestyle in post WWI Europe she is exiled by her family to the British colony of Kenya. Life there is as jaded as in Europe abd more scandal awaits her, but so does a man who might finally help her find peace. A love story of Kenya as much as Delilah and Ryder. If you like reading books set in the 1920s, this one gives you a fascinating look into the Africa of that era. Looking for a midwinter escape? I happily recommend this delightful story of friendship and love. There is a magical element that provides an unusual twist. I've really enjoyed all of this author's books; she always has a humorous touch which adds to your reading pleasure. Very entertaining.